Project Jaðrakan encompasses many people for whom understanding and conserving Icelandic Black-tailed Godwits is a passion. We focus our attention on the Icelandic population of this species that is locally known as Jaðrakan (Limosa limosa islandica). Our scientific research involves people from many countries around Europe and aims to unravel the population dynamics and migration strategies of this graceful bird. 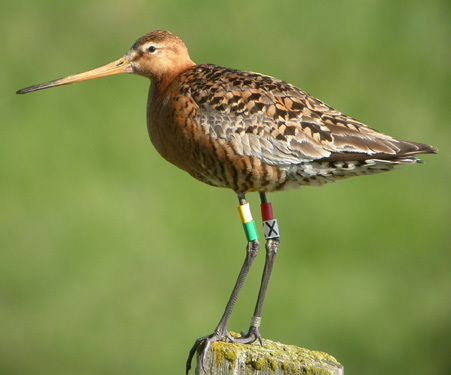 We have developed a database to record the movements of individually colour-ringed Godwits. These show in remarkable detail the migration routes and choice of habitats of individual birds throughout the entire range of the population. Mapping these movements is only possible because of the vast network of volunteer observers across the Icelandic Black-tailed Godwit range who report sightings of colour-ringed birds. In conjunction with detailed field studies at several key locations, these data provide a unique opportunity to explore issues such as the impact of climatic and land-use changes on population size and distribution. The team of Project Ja�rakan is a gathering of people with similar interests and a common fascination with Icelandic Black-tailed Godwits. Currently the team includes people from several backgrounds and distinct professional activities that share a passion to better understand migratory systems, with the ultimate goal of better preserving our natural heritage.